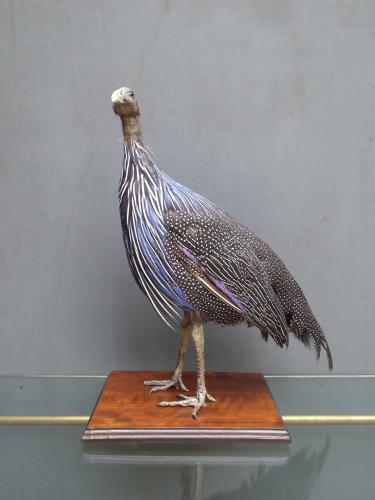 A rare taxidermy study of a Vulturine Guinea Fowl. A stunning & very unusual piece of taxidermy, beautifully executed & mounted on a solid mahogany base. The Vulturine Guinea Fowl is the largest species of Guinea Fowl & is characterised by its beautiful black, white & cobalt blue plumage and bald vulture-like head & neck. The species is not under threat, however taxidermy examples are uncommon given the high value of the brightly coloured feathers to fly fisherman. Not much age, probaby late 20th century. In excellent condition, one wing feather to the rear appears to be cut short & one claw missing, otherwise perfect.